They say every picture tells a thousand words. If that’s the case, Kerri Kirshner has the power to speak volumes about special-needs families. The Bothell photographer has a growing list of clientele whose children have disabilities. 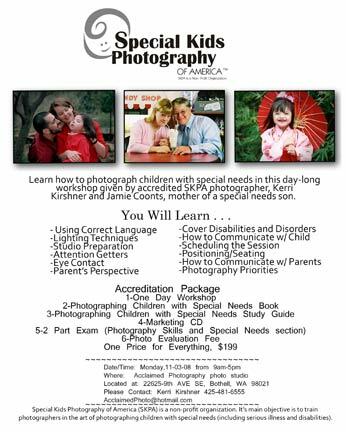 Kirshner is accredited through Special Kids Photography of America, a nonprofit organization that trains photographers to work with special-needs subjects. From autism to amputations, she’s ready to cover it all, taking her craft into a realm where few professionals in her field have the confidence to go. Getting the job done takes patience and flexibility. “Sometimes you just have to follow a kid for hours until you get that one good shot,” Kirshner said. That moment can come at any time: while the photographer is packing up, when a child is being comforted or after a scheduled session has officially ended. “With special-needs kids, their parents light up when you get a good image,” Kirshner said. Snohomish resident Jamie Coonts hired Kirshner to shoot portraits of her late son, Jameson, who lived until the age of 5 with fragile health and undiagnosed developmental delays. The photos ended up capturing tender moments between the boy and his parents. Coonts trusted Kirshner enough to bring her in for another shoot after Jameson died of the stomach flu in August of 2006. “I called her from the hospital,” Coonts said. Kirshner also created images for the first anniversary of Jameson’s death, taking shots of Jamie in her son’s memorial garden. “A relationship started to grow from the first session we had,” Coonts said. Today, the pair is collaborating on a photo book that will feature kids with undiagnosed disabilities. Kirshner’s role is to capture the images, while Coonts gathers parent quotes and uses her connections with the special-needs community to find participants. The goal is to raise awareness and change society’s perception of special-needs children. “I’ve always said that I wish everyone could know what it’s like having a relationship with a child like my son,” Coonts said. Kirshner also does traditional portraits, and has won four awards this year through the Seattle Professional Photographers Association. She is the owner of Acclaimed Photography in Bothell. • For information about Acclaimed Photography, visit http://www.acclaimedphoto.com or call (425) 481-6555. Bothell Reporter Reporter Joshua Hicks can be reached at jhicks@bothell-reporter.com or 425-483-3732.